I didn’t think I was a germaphobe until yesterday. I was playing hockey yesterday morning and I look next to me on the bench and see a teammate pick-up my water bottle (the one pictures above with “Girls” and a female hockey player on it…) and squeeze water into his mouth. And then he closed the lid of my water bottle with his teeth. I didn’t say anything (besides…awkward!). 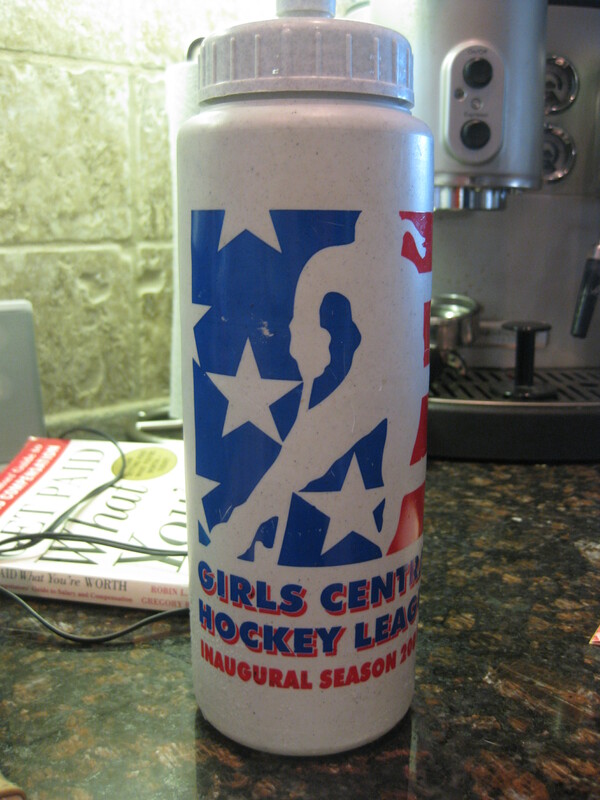 It was the 3rd period with 7 minutes to go…I could make it without water. I go out, skate a shift, and return to the bench. Another fellow teammate picks up my water bottle and squeezes water into his mouth. Hm. Gross. Not that that water bottle wasn’t going into the dishwasher anyways, but c’mon people! MY WATER BOTTLE. And um, for how many MONTHS now have people been helping themselves (and their teeth) to MY water bottle!? No wonder I had a cold ALL of last week!!! It’s not that I’m not a good sharer, because I am (and because sharing is caring, right?). Maybe it’s because I witness on a weekly basis these men spitting loogies and snot-rocketing green deposits onto the ground of the rink and onto the ice…and smell their stench of never washed nor left-out-to-dry equipment. 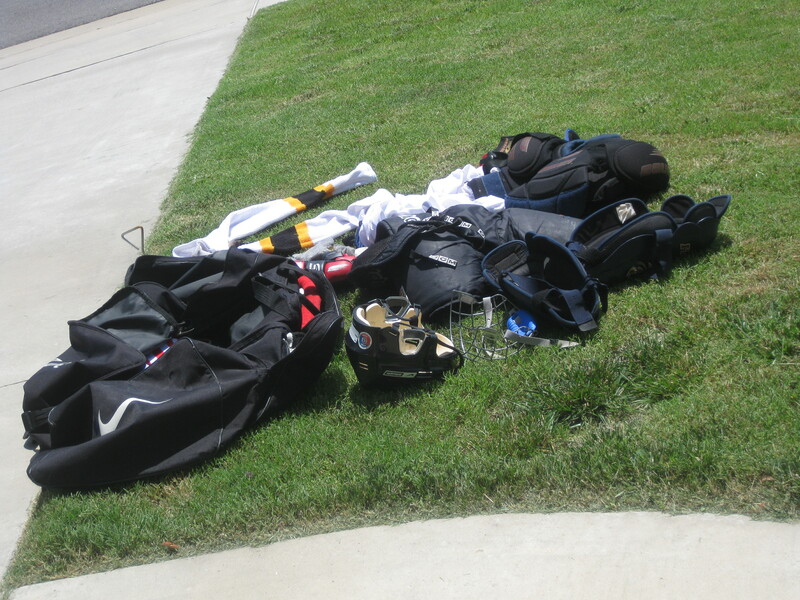 Hockey is a not a pleasant-smelling, cleanly sport….but at least I air my equipment out between games? …And I don’t use other people’s water bottles. ESPECIALLY WITH MY TEETH. Or without asking. And I came home from hockey game #2 to prepare a meal I was very excited about…Coconut Almond Crusted Tilapia, Coconut Lime Rice, and Grilled Pineapple Rings. SOOOO GOOD! Line a baking sheet. Combine almonds, coconut and salt & pepper. Pulse in food processor until well combined. It should be the texture of breadcrumbs. Lay tilapia on baking sheet. Sprinkle with garlic salt. Sprinkle nut/coconut mixture on top of each filet. Spray tops of each filet with olive oil. Bake for about 20 minutes, until top is lightly browned and tilapia is cooked through & flakey. Yield: 4 4-ounce portions. Result: What a fun way to eat tilapia! The almond taste is more distinct than the coconut, but the combination is delightful! I loved the fish, and especially loved how easy it was! 🙂 Thanks, Marla! Bring coconut milk, salt, and 2 cups water to a boil in a saucepan over medium heat. Stir in rice; cover, reduce heat to low, and simmer, stirring occasionally, 20 to 25 minutes or until liquid is absorbed and rice is tender. Stir in lime zest and juice. Yield: 6 servings. 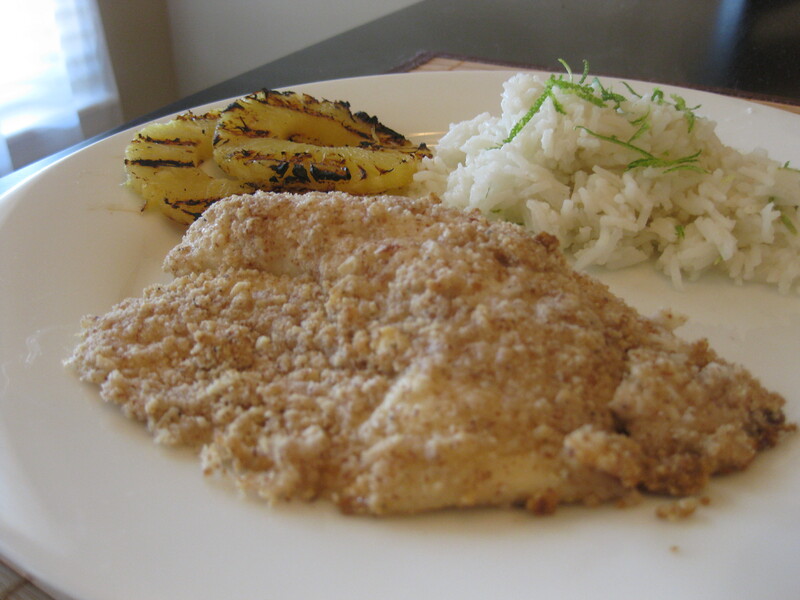 Result: What a fun side dish to pair with Coconut Almond Crusted Tilapia, no? 😉 This was a subtly sweet coconut-lime rice that would pair well with just about anything. And again, very easy to make! Yum!! Question: Are you a germaphobe? What food or beverage sharing are you not okay with? Request: If you have a Q&A question, please send it to me at PreventionRD@gmail.com. It’s been a while, but if you have a question, I will get you an answer! P.S. Faith is giving away a bunch of neat bamboo loot! Check it out! « Giving ginseng a go! Ha! I’m not a germaphobe either, but yeah, that would gross me out! And piss me off too– who drinks from someone else’s water bottle?!? I’m not a huge germaphobe, but I HATE sharing silverware and cups with people – even my family! I’m surprised more than one person would just do that! I’d never think of just picking up someone else’s water bottle and drinking it. Then again, I’m a tad of a germaphobe…I HATE being sick. That is pretty gross, and I am the opposite of a germophobe! Ew, that’s gross. Boys. I’m a total germaphobe and won’t share drinks with anyone–besides my husband sometimes. I’m more grossed out by touching door handles in public, especially rest rooms. I’m definitely not a germaphobe, but I’d be grossed out by that too. I don’t mind sharing my water bottle with my family/friends or even my dog (it’s hard to not want to give her a little when she’s hot and panting on our walks), but I would NOT be ok with a stranger drinking from it, especially if they didn’t even ask. RUDE!! I am not a germaphobe but that would gross me out too. I share with people I know and that’s about it. How odd? “How rude!” is right! I’m not a germaphobe (really, at all), but I would never drink from someone’s bottle, especially without asking…and especially using my teeth! It’s weird but a lot of germaphobes I know actually seem to be sick quite often…hmmm…. I am a germaphobe. I only share with my husband. That is just gross. I’m definitely not a germophobe. That wouldn’t bother me at all if someone closed my water bottle with their teeth. That would’ve grossed me out too! That is a bit odd that someone would just help themselves, but it’s kind of akward to say something to them–but I am not too big a fan of sharing when it comes to being able to catch sicknesses and such! Love the tropical coconut meal–yummy! I am not too bad when it comes to germs, but that is just plain gross! Leave it to men though! My daughter even has hand sanitizer on her key chain – she’s my germophobe! I wish I liked tilapia, it has a strange aftertaste to me. 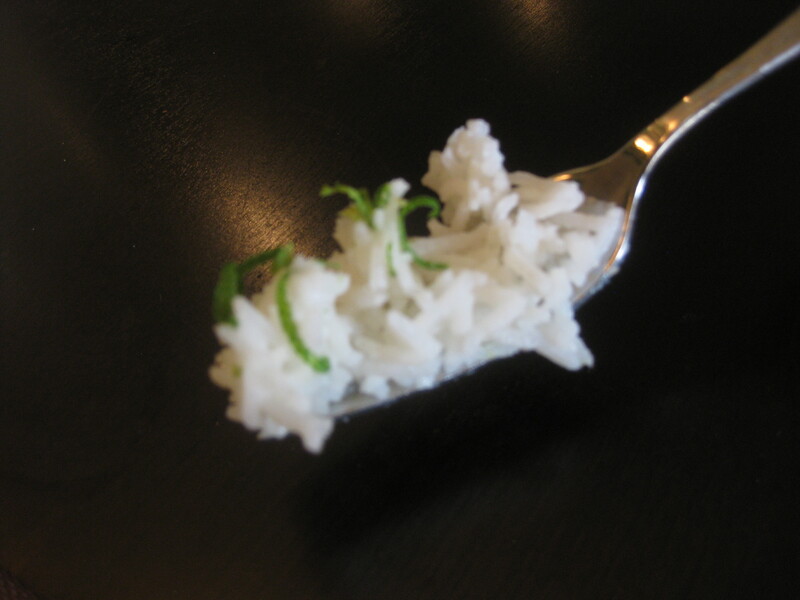 Love the lime rice though! I’m not really a germophobe but that would gross me out quite a bit! I’m more grossed out by dirty dishes. I’m not down with someone putting their teeth on the little tab on my water bottle. When I went rowing, there was this woman all over the place — in my sunscreen which I didn’t mind but she paid no attention to which water bottle she was picking up which I did mind. Yep, I’m a bit of a germaphobe too. I definitely don’t drink out of the same glass or bottle as someone else – no thanks! And I LOVED your little quote from Michelle Tanner – totally made me smile :-). 80% germaphobe, but that’s really gross!!! 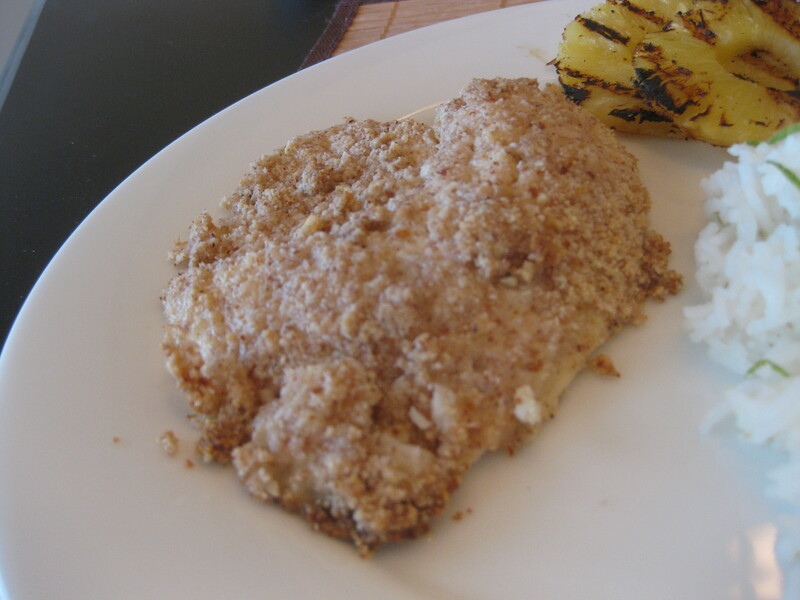 Owww I love crusted Tilapia, it sounds really yummy! I’m gonna make this! I know couples who will share a toothbrush in a pinch. I love my husband dearly and am always happy for a kiss, but I will run out and buy my own toothbrush if one is forgotten regardless of the time of day or night or if really desperate, use my finger, before I would share a toothbrush even with him. I have a line. Brushing grime off teeth with the same toothbrush crosses it. I’m not a germaphobe for the most part. I don’t mind drinking after P or one of my close friends..even though I know it’s a terrible habit. With that being said, it would freak me out if someone else grabbed my water bottle and drank out of it..especially with their teeth. Ewww. Ewww that is nasty! I can imagine their sweat dripping down and drinking your water…no bueno! i am usually not a germaphobe but sucking on a water bottle is kind of gross! I’m not a germaphobe, but sweat and drinking water kinds grosses me out. Ah. I would be pretty grossed out with that water bottle situation!!!!!! That’s so cool you play hockey! 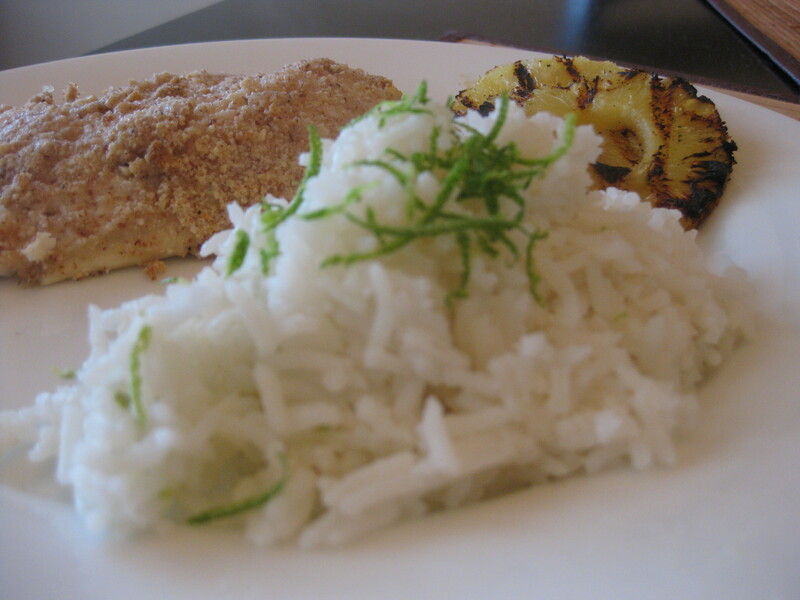 The tilapia with with coconut rice looks awesome…great combination! I guess I am a little bit of a germophobe…I don’t think I realized that until just now, lol! I got a little freaked out when you said that someone was touching your water bottle (you never know where somebody else’s hands have been!) but to hear that he drank out of your bottle and then closed it with his teeth! Ugh! Haha, the sharing thing must have been frustrating! I have to admit though, and this will prob gross you out, but I have no problem with sharing everything and anything. I’d even use Daniel’s or my best friend’s toothbrush. Gross, right? I know, I should prob be more worried about germs. And the fish looks divine! Taking water bottle without permission is just not done, its really rude, i wouldnt mind sharing it if someone ask …. I am not a germaphobe. Case in point, my gecko has remained in my kitchen sink for a week :). But those guys sound disgusting to be sharing water bottles. One of the most repulsive sounds to me is hacking up a loogie. I cringe just thinking about it. Have you got a new strategy to keep them away in the future? Good luck! Ah, the lucky part about being a goalie… water bottle on net, no one ever drank from it. For the most part I’m not a germaphobe. Things like you mentioned does though as it’s more than germs you caan pick up these days from other folks! I just made this tilapia recipe for dinner tonight (I realize the blog post is a few years old, but I just found your site!). I already had some cooked brown rice, so will have to try the rice recipe another time. The tilipia is wonderful! I love the combination of almonds and coconut. It was extremely easy to make, too, which I appreciated tonight. Thanks! Thanks, Kathy! 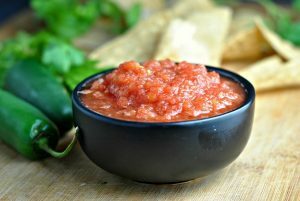 Hope you find more recipes you love and enjoy!